One of the biggest shortcomings in evaluating players’ performance based on their performance statistics (i.e., the outcome of the batter—pitcher matchup) is the uneven quality of opponents that players face. Baseball analysts have made it a priority to adjust for the ballpark in which the players perform, recognizing the profound effect it can have on a player’s accomplishments, as measured by his performance stats. But far less energy has been devoted to adjusting for the quality of the competitors a batter or pitcher face over the course of a season. In the case of ballparks, perhaps the potential effects are more obvious as we watch a 320 foot pop up into the right field corner at Yankee Stadium land in the seats for a home run. We intuitively know (or the broadcasters will tell us) that in 29 other ballparks the right fielder would have camped under the ball to record a routine out. As a result, park factors have become a common element of baseball analysis and player evaluation. It’s far less obvious (and difficult to measure) that the MLB schedule dictates that some hitters routinely face difficult pitchers, while others face pitchers that are less accomplished. The quality of opponents is even more varied for starting pitchers. Take an unbalanced schedule and match up a starter with an opponent team every 5th day and you’re apt to get an even more skewed distribution of batter-pitcher matchups. There are many ways to create a statistical adjustment in the form of an “opponent factor”—much like a park factor—some more complicated than others. The simplest albeit crude adjustment is to look at the OPS of the opponent a pitcher faces. For perspective, the MLB average OPS for this season is .726 (.718 in the NL and .734 in the AL, with the difference largely due to the designated hitter). The Rays’ David Price has faced opponent lineups this year that have hit left-handed starting pitchers to the tune of a .757 OPS. On the other extreme, the Cardinals’ Jaime Garcia (currently injured) has faced opponents with a .693 OPS. The reasons this gap is so large is the combination of the unbalanced schedule and the wide range of offensive performance across teams. For example, the Cardinals are batting a remarkable .861 against left-handed starting pitchers, while a team in their same division, the Cubs are hitting a meager .645—a difference of over 200 percentage points in OPS. Using our simplistic measure of the quality of a starting pitcher’s opponents, it’s interesting to note the clustering of the “degree of difficulty” by Division. The AL East hits .751 against LH starters and .738 vs. RH starters. The comparable MLB-wide OPS stats are .729 and .724, respectively. So, it is not surprising to see 4 Oriole starting pitchers among the top 20 pitchers that have faced the toughest lineups this season. In fact, 9 of the top 20 are AL East pitchers. There are only three National Leaguers in the top 20—Mike Minor (2), Eric Bedard (14), and Paul Maholm (20). Minor faced the Yankees twice, with their gaudy .839 OPS against lefty starters. On the other end of the spectrum, the bottom 20 list—the pitcher’s that faced the weakest lineups— is loaded with NL’ers, including every Rockies starter. Several notables are Madison Bumgarner and Gio Gonzalez. Out of 140 starting pitchers, they rank 129 and 134, respectively, in terms of the degree of difficulty their opponent lineups presented. The only American League starters in the bottom 20 are Scott Diamond (123), Ricky Romero (125). I incorporate these adjustments into my Starting Pitcher Ranking system (SPR), which I will write more about in the coming weeks. Given the acceptance of ballpark effects and the overall level of sophistication of statistical analysis in today’s game, it’s time to formalize our adjustment of all players’ performance stats for the quality of the opposition. The elimination of draft pick compensation for traded players in the new CBA is having a profound impact on the mid-season trade market for players like Hamels. Signing Hamels was a necessary move by the Phillies, but will present other challenges to the organization. Prior to the Hamels signing, the Phillies had about $110m in salary obligations for the 2013 season committed to six players—Lee, Halladay, Papelbon, Howard, Utley, and Rollins. That commitment would rise to the low $120’s if Hunter Pence is retained. The Hamels extension places the Phillies’ obligations at more than $145 million for eight players. Without any major trades from that group, the Phillies would need to fill about 17 roster spots at an average salary of about $2 million, in order to not exceed the Competitive Balance Tax threshold for 2013. We’re very likely to see either Halladay or Lee dealt, either in the next few days, or at the end of the season. Not only do the Phillies need to reduce the concentration of their payroll that is clustered in a handful of players, but they also need to restock with younger, low cost players who can ultimately make an impact on their major league roster. By signing Hamels, the Phillies retain the youngest of their three aces, who also happens to have the lowest value in the mid-season trade market. An unsigned Hamels had limited trade value as a pure summer rental, when compared to Halladay or Lee, who are signed through 2014 and 2016, respectively (including their option years). Hamels would have provided an acquiring team about 12 or 13 starts over the balance of the regular season, while Halladay provides about 80 starts over the next 2½ years, at a below market salary, given his talent level. The elimination of draft pick compensation significantly changes the value equation for mid-season trades by devaluing pure rental players with expiring contracts. For example, when CC Sabathia was traded from Cleveland to Milwaukee in July of 2008, the package included Matt LaPorta, a number 7 overall pick and the top rated prospect in the Brewers system, plus Michael Brantley, and pitchers Rob Bryson and Zach Jackson. That impressive haul was supported by the draft pick compensation the Brewers could count on when Sabathia walked away in November. When Sabathia left Milwaukee for the Yankees, the Brewers received the 39th and 73rd overall picks as compensation. Under the new rules, Hamels was likely to yield no more than a couple of mid-level prospects. The way to circumvent the elimination of draft pick compensation is to deal players before the last year of their contract. This diminishes its importance, as draft pick compensation becomes a lower percentage of the total value the player provides to his acquiring team. While dealing Hamels might have gotten the Phillies a couple of mid- to low-level prospects, dealing Halladay or Lee puts them in the mix to secure a prospect package that includes a top talent like the Rangers 19-year old shortstop sensation Jurickson Profar. 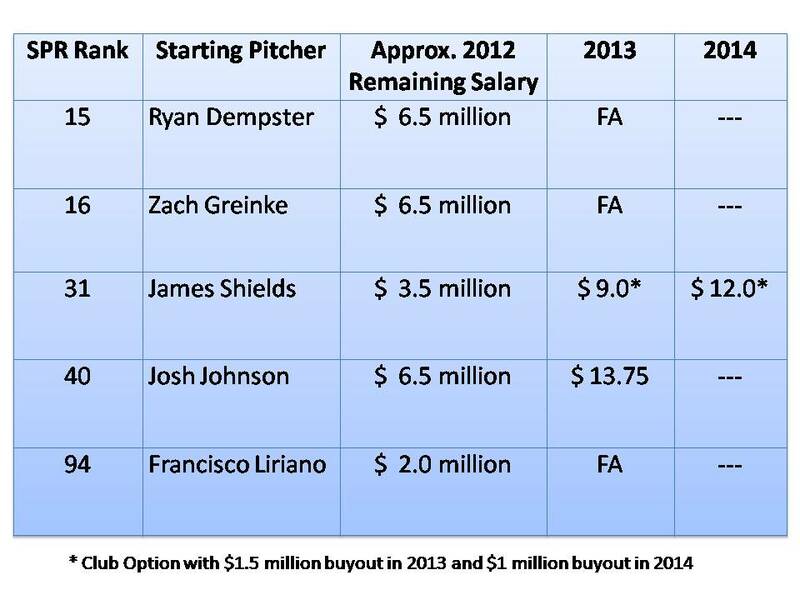 The value of Hamels’ contract may be a foreshadowing of what to expect in the upcoming free agent market. In a world where Sabathia gets $161 million (3½ years ago) and Pujols and Fielder sign $200+ million deals, it would be reasonable to expect that one of baseball’s top pitchers, entering his age 29 season would get a $170+ million deal. My statistical models of the behavior of the free agent market support that valuation, at least under the rules of the old CBA. (While the deal was reported as 6-year, $144 million, it is said to contain a seventh year option that could take its value as high as $162 million.) Maybe Hamels gave the Phillies a hometown discount, or perhaps we are not living in the Sabathia, Pujols, Fielder world anymore. The Competitive Balance Tax threshold, which will rise to $189 million by 2014, may put a damper on the high-end free agent salaries, as teams will be reluctant to commit too many dollars to any one player. We’ll know more in the coming months. The re-signing of Hamels is an important move in the Phillies quest to extend their competitive window. The reality is the Phillies have too many high-priced players and will be challenged to surround them with enough talent to stay competitive under the new Collective Bargaining Agreement. They need to acquire high potential minor league talent to provide a low cost source of future wins and provide better balance to their payroll. Halladay or Lee become the perfect trade chips to accomplish both objectives. I’ve loved the wild card from its inception in 1995 and I love the addition of a 2nd wild card even more. The new playoff format rationalizes the postseason for MLB—it provides appropriate playoff advantages and disadvantages based on regular season performance. Coupled with a schedule that has more uniformity (beginning in 2013) for teams competing in the same division, it’s a better system. Under the old format (1995-2011), it’s fair to say a postseason berth was a 1-in-8 lottery ticket to a world championship. (In fact, of the 34 wild card teams, 5 have won the World Series). In the new two wild card system, the teams with the best regular season will have a decided advantage. Since the two wild cards in each league will meet for a one-and-done play-in game, this cuts the probability in half that a wild card team will reach the final eight teams. The wild cards are disadvantaged even further by needing to use their ace starter for the all important play-in game, leaving the wild card winner to potentially face a #1 seed, with one (pitching) arm tied behind their back. For example, imagine a wild card winning Angels club having to start their 2, 3, 4, 1 against the Yankees 1, 2, 3, 4. Not only is it a decided disadvantage for the wild card entrants, but also a boost for the #1 seed in each league. At this point I don’t know enough about how the new format will play out to have the conviction to place odds on each seed, but the old “1-in-8” could range from a 15% to 20% chance for teams in each league with the best regular season record, to a 5% chance for the 2nd wild card qualifier. That’s a big shift from the former egalitarian playoff format. What are the implications for trade deadline deals? Since we know the real financial payoff for a team’s performance results from a run through the postseason—the deeper the run, the richer the pot of gold—teams will need to shift their mindset to not treat all postseason qualifying positions as “equal”. In the new system, it may make more sense to fortify your ballclub when your playoff status is assured, but being anointed a division winner is still in question—think Texas or even the Angels. However, a team fighting for a wild card berth should think twice before they go all-in for the privilege of potentially extending their season for one more day. This is the exact opposite of the old mindset—do everything you can to qualify for the playoffs, but don’t worry too much about winning the division. Will there be a pot of gold at the end of the rainbow for the team that loses the wild card play-in game and is home watching after its 163rd game? Over the last 17 seasons we have seen fans reward their home teams in the year(s) following a playoff appearance by stepping up their season ticket commitments, absorbing aggressive increases in ticket prices, spiking their viewership of telecasts, and increasing their sponsorship dollars. The deeper the run into October, the greater the fan enthusiasm and spending. A playoff team immediately became a World Series contender and fans wanted to be part of the action. Are the days of ignoring the path a team took to reach the playoffs over? Will the media and fans treat the wild cards as true playoff teams, or will they anoint only the play-in game winner as a playoff team? I suspect that by mid-October, fans of wild card teams will be bemoaning their fate and the rough road they will need to ride to reach or win the World Series. For those teams, the answer is simple, even if the quest is challenging—win your division. Thanks for stopping by. I’m the author of Diamond Dollars: The Economics of Winning in Baseball, the President of SABR, and a consultant to MLB teams. I also teach in the graduate Sports Management programs at Columbia University and Manhattanville College. My research, analysis and writing falls into the category of baseball analytics—using information and data to shed light on the complex issues that baseball teams face when considering trades, free agent signings, evaluating playing talent, and other roster decisions. I’ll use this blog to share my insights and analysis on these and other baseball related topics. If you are inclined to read this blog, even occasionally, you should consider joining SABR—The Society for American Baseball Research. SABR is a non-profit community of over 6,000 passionate baseball lovers from around the world, who are dedicated to deepening our understanding and appreciation of the great game of baseball. 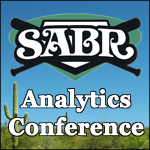 With 26 research committees ranging from statistical analysis to the origins of baseball and the deadball era, to baseball and the arts and women in baseball, SABR has something for everyone. There are also 60 regional chapters hosting events and gatherings for members throughout the year. As a SABR member you also receive first-rate publications (free) and discounts on baseball books and conferences, as these are all included with our modestly priced SABR membership, so check it out now.